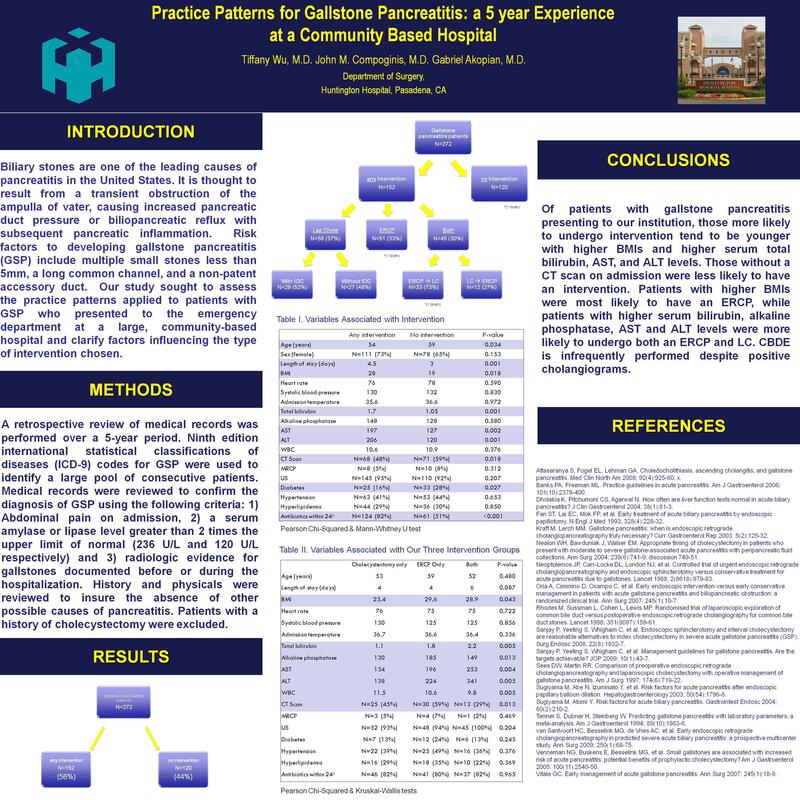 Objective: To assess the practice patterns applied to patients with gallstone pancreatitis (GSP) who presented to the emergency department at large, community-based hospital and clarify factors influencing the type of intervention chosen. Methods: A retrospective review of medical records was performed over a 5-year period. Ninth edition international statistical classifications of diseases (ICD-9) codes for GSP were used to identify a large pool of consecutive patients. Medical records were reviewed to confirm the diagnosis of GSP using the following criteria: 1) Abdominal pain on admission, 2) a serum amylase or lipase level greater than 2 times the upper limit of normal (236 U/L and 120 U/L respectively) and 3) radiologic evidence for gallstones documented before or during the hospitalization. History and physicals were reviewed to insure the absence of other possible causes of pancreatitis. Patients with a history of cholecystectomy were excluded. Results: Two hundred seventy two patients met the inclusion criteria. Fifty-six percent of patients had at least one intervention (laparoscopic cholecystectomy, endoscopic retrograde cholangiopancreatography or both) while 44% had no intervention during hospitalization. Patients who underwent interventions were younger (p=0.034), had longer lengths of stay (p=0.001), had higher BMIs (p=0.018), serum bilirubin levels (p=0.001) and liver enzymes (p<0.01). They were also more likely to be started on antibiotics on admission (p < 0.01). Patients who received a CT scan on presentation were less likely to undergo an intervention (p=0.018). Of patients who underwent interventions, 37% had a laparoscopic cholecystectomy (LC) only, 33% percent had ERCP only and 30% had both an ERCP and LC. Patients with higher BMIs were more likely to have an ERCP (p=0.043) and those with higher serum bilirubin, alkaline phosphatase, AST and ALT levels were more likely to undergo both an ERCP and LC (p <0.05). Patients presenting with leukocytosis tended to have LC only during their hospitalization (p=0.005). CT scan on admission was associated with ERCP only (p=0.013). Of patients who had either a LC only or LC followed by ERCP- 56% had cholangiograms and 14 of 38 cholangiograms were positive. Of those, 4 had no further intervention. This included 2 successful common bile duct explorations (CBDE). The other 10 patients went on to have ERCPs- with only one patient having had a failed CBDE attempt. Only 21% of positive IOC resulted in CBDE. Conclusions: Of patients with gallstone pancreatitis presenting to our institution, those more likely to undergo intervention tend to be younger with higher BMIs and higher serum total bilirubin, AST, and ALT levels. Those without a CT scan on admission were less likely to have an intervention. Patients with higher BMIs were most likely to have an ERCP, while patients with higher serum bilirubin, alkaline phosphatase, AST and ALT levels were more likely to undergo both an ERCP and LC. CBDE is infrequently performed despite positive cholangiograms.